Though a crucial and essential part of the deck building process, Deck Screws can often be overlooked. With so many options and similar looking products, how's anyone to know what type of screw is the best for them? Here's an overview to help you understand the different parts of fasteners as well as the most common applications for them. 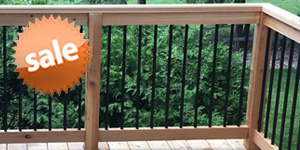 From hardwoods to treated lumber, to composite and capstock decking, or even metal framing; DecksDirect can provide the perfect fasteners and lags to complete your project without rusting, splitting or mushrooming your material. 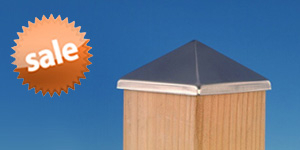 Help your deck last its longest and constantly look its best with the right Deck Screws and Fasteners for your design. Head: The head of the screw will be the area on top that will still be visible when fully installed. The style and shape needed will vary based upon the material and application the screws are being used. Common types used in deck building are Flat/Bugle, Trim, Truss, Hex, and Cap/Undercut heads. Drive: The drive is located within the head of the screw and determines the driver bit that will be used to install the fasteners. Typical drive types include Phillips, Square, Slotted, Torx/Star, or Hex/Allen Drives. The more engaged your drive type, the less prone your screw is to stripping or slipping off the bit when being installed. 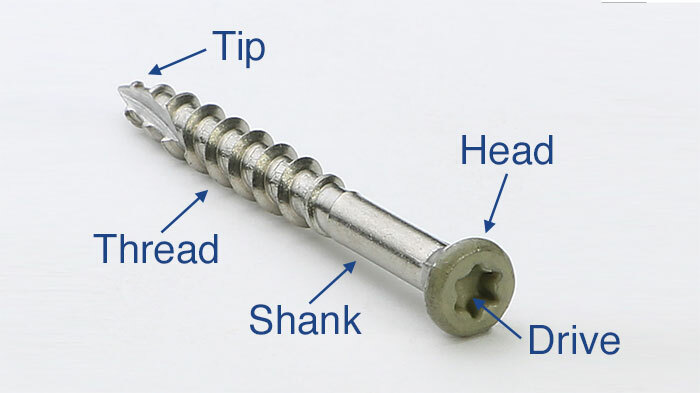 Shank: The shank is the unthreaded part of a screw between the head and the thread itself. The shank will denote the width and thickness of the screw itself. The shank area of a screw serves two purposes: it allows the screw to pull the two pieces of material together and keeps the screw from overheating which can lead to breaking or snapping. Thread: The thread is the helical, or spiraling, section of that runs around the body of the screw. When driven into the material, the thread of the screw digs into the fibers and tightens, essentially embedding itself into the wood. Some screws, such as those for composite decking, have additional reverse threads for pulling the material downwards and ensure there will be no mushrooming of the board. Tip: The initial entry point for the screw to enter the board or material. 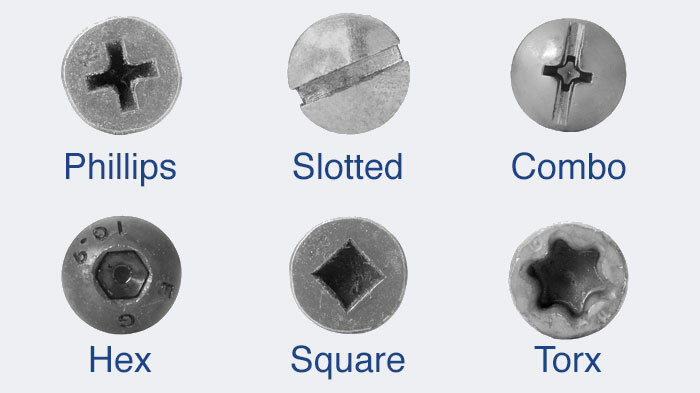 Depending upon the type, tips can reduce the need for drilling pilot holes, reduce the amount of torque needed to install the screws, and decrease the chance of splitting any wood material. 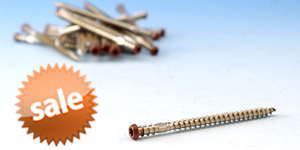 Flat and Bugle head screws are the most commonly purchased screw type. Widely used for general construction as well as structural applications, the head can be installed flush with the material, or driven deeper into a counterbore and concealed with a plug. Trim head screws are generally used for finishing applications such as trim itself or installing fascia boards on your deck. Trim head screws are smaller with a much more unobtrusive look, yet offer the same holding power of a standard screw or nail. Truss head screws feature an extra wide head that is slightly rounded over top. This allows the head to protrude just above the surface to be fastened but contains a wider surface area underneath the head. Truss screws are wonderful in securing thin, one-ply materials, applications where a larger hole is needed for later adjustment, or landscaping situations. Hex head screws have a hexagonal head with a built-in washer to help distribute the weight load to a wider area. Hex head screws have an integrated washer built into the head to provide superior holding power without the need for separate pieces. Generally, hex head screws are used for structural wood to wood applications such as framing, ledgers, and joists. 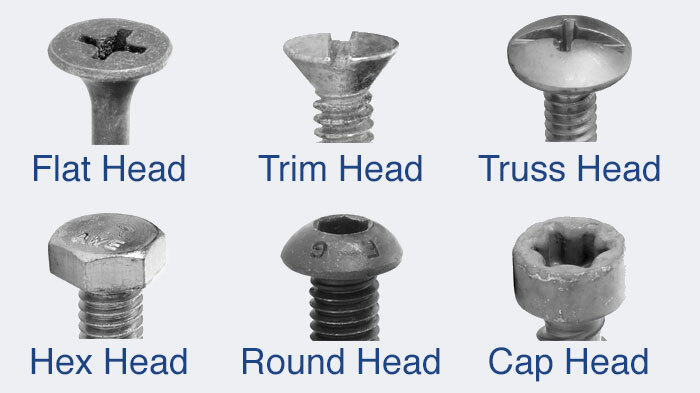 Cap, or Undercut, head screws are typically used for installing composite decking material onto your deck framing. The screws boast a taller head to help penetrate the hard outer capstock of the deck boards, while also featuring a reverse thread to prevent mushrooming. 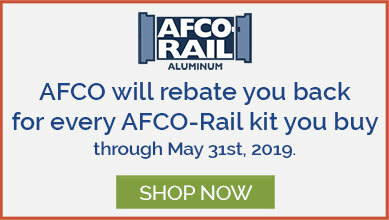 Available in a variety of colors, the heads of these screws can blend into the surface of your decking for a clean look. The drive portion of the screw is incredibly important as that refers to the type of tool you'll need to correctly install the screw. Ranging from a simple Slotted drive to a more intricate Torx or Spider drive; the drive type you choose often can correlate with the amount of torque you can use when installing the screw, as well as how frequently a screw can be stripped or slipped. Common drive types such as the Phillips or Combo can be tightened and driven with tools that many of us already have in our tool box, making them an easy choice for builders on a budget as no extra tools or bits are needed. Stripping the screws with these drives, however, is common and you can expect to render a good handful of these screws ineffective at the end. More detailed drive types such as the Hex, Torx, or Spider allow your driver bit to engage with the drive more, actively leading to virtually no stripping and a strong application every time. These more precise driver bits do often have to be purchased separately, so it should be taken into account when choosing the right screw for a project.